The Laundry Solution, a 21ST Century technology, promises to free us from environmentally-damaging and harsh laundry detergents. 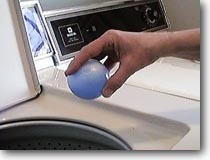 Laundry Balls are non-polluting, non-toxic, hypo-allergenic, color-safe, convenient, economical, do not promote static cling and will not damage fabrics. Independent investigation reveals that they are so benign as to be virtually inert. But it’s hard to dismiss the reports of strong customer satisfaction. Buy one and you can use it for 1,500, 3,000, maybe even 4,000 or more loads of laundry. Skip the rinse cycle, never pay another dime for detergent, save the planet and keep harsh chemicals out of your clothes. The pitch for these laundry balls gets more baroque over time, but basically the theory is that by using magnets, the balls rip apart clusters of water molecules that form naturally by magnetic attraction. When these clusters are ripped apart, creating “activated” or “structured” water, it makes it easier for individual water molecules to get at the junk you’re trying to remove from your dirties. All without expensive, damaging, and unhealthy chemical detergents. Aren’t magnets simply amazing! Is there anything they can’t do? [T]hey do absolutely nothing except make you feel comfortable with not using detergent. If you can convince yourself to use less detergent without a little plastic ball, you get all the benefits and you don’t have to pay for the ball. Now to me this seems like a delightful way to keep overconsumptive Americans from polluting the water supply while at the same time helping to ease the burden that excess cash has on the overly gullible. Those members of society pledged to protect us from ourselves are much more hostile to the devices. The Oregon state attorney general, for instance, won $190,000 from two companies selling such products, in a settlement in which the companies agreed to stop selling their wares in Oregon, but were not required to admit to any criminal fraud. [T]he department of Justice obtained the various products and had them tested by a qualified, independent laboratory. 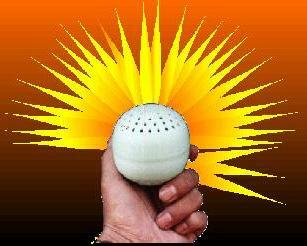 Results of the tests indicated that the water in the spheres had no special characteristics. The “globe products” essentially contain nothing more than water, blue dye and a foaming additive contained within an impermeable plastic shell. Utah’s Division of Consumer Protection also dragged $10,000 away from one company whose miracle balls were clearly too good to be true. Everything at room temperature emits far-infrared electromagnetic radiation. So does their product. The water is specially treated, since water doesn’t occur naturally in plastic globes. Water plus mechanical action will clean quite well. Since the globe is small, it won’t interfere with the mechanical action of the washer or displace much water. The company recommends a procedure to clean out the washer before the first use of their product. The procedure will remove soap scum and mineral buildup… This could account for any repeatable observations of “brightness” the first time the product is used. The power of multilevel marketing has led to an amazing proliferation of “structured water” products whose profit margins must be absolutely breathtaking. Onesource Worldwide Network, for instance, puts forth the bold claim (and probably a different claim than it makes to the IRS), that in “nine short months” it has “paid out an unprecedented $6.7 million in commissions” on “more than $84 million in product.” The sidebar to the right lists only a select sample of cyberhucksters; hit the search engines for more. It’s hard to say how many of the folks selling detergent placebos know about their bogus nature. Some are probably just as taken in as their customers. Others, like The AwareHouse (which calls their product The Emperor’s New Detergent) or Judy & Company (which sells a product they’ve dubbed “Snake Oils” which “have specially treated waters called Structured Waters”) probably sleep well at night despite vending bunk. I’m thinking of marketing a somewhat similar product: Dihydrogen monoxide. For all that’s been written about its alleged dangers, DHMO is actually a quite benign solvent and a normal component of the atmosphere — you can actually drink small quantities of the stuff without harm. My special DHMO mixture, when added in sufficient amounts to the gas tank of your vehicle, will almost completely prevent the harmful environmental degradation caused by the oxidation of fossil fuels in the engine. As we all know, the products of fuel oxidation are responsible for much of the pollution of our precious air and water supply. Furthermore, DHMO will substantially reduce your risk of injury or death in vehicular collisions, and will result in fuel savings as well. In California, if you pledge to use DHMO exclusively throughout the year, you may be eligible for a special certificate from the Department of Motor Vehicles allowing you to a special bargain rate on automobile registration and a complete exemption from emissions control verification (the “smog check”). When gasoline remains in your tank for a while, the fuel molecules start to cluster. The molecules on the inside of these clusters can’t be exposed to the oxygen necessary for combustion. The result: Incomplete fuel burn with the unburned molecules emitted as pollution or remaining inside your engine as damaging carbon/varnish deposits. When fuel burns, carbons are combined with oxygen and converted into their components, releasing energy. Passing fuel through a magnetic energy field which is both properly configured and focused causes the fuel to accept an induced charge. Furthermore, this application of highly focused physics will attract more oxygen molecules to the fuel resulting in more of the available fuel being completely utilized. Unlike the laundry balls, though, which at least save you money on more-or-less worthless detergents; the fuel magnets (and magnetic air filters) appear to have no benefits to those who aren’t selling them. Among the best pseudoscientific gobbledygook comes from this explanation of the Grander Process, in which “[t]he water to be treated is channeled (without coming into direct contact) along a concentrated fluid that has been treated with specific naturally occurring high frequency fields. This fluid serves as an organization template for the water structuring. Thus, the oscillatory composition of the water is harmonized and the water becomes more and more of a mediator for natural oscillation energy…” Say what you will about this sort of advertising, it’s legal. The Natural Wash Plus system (U.S. $39.95) is even anti-bacterial! As seen on TV, AsiaNation Direct Laundry Balls also can be used to wash cars, dishes, floors & work surfaces, vegetables and flowers, people and food. Things you wash with Laundry Balls stay cleaner longer, because they don’t attract dust; vegetables washed with Laundry Balls stay fresh longer; and pre-treating your water with Laundry Balls improves the growth of your houseplants. Bathing with Laundry Balls relieves “tension, stress, rheumatic pain, stiffness and poor circulation” and “can lead to the remission of athlete’s foot, fungal infections and split skin.” Put one in the back of the fridge to absorb odors and help preserve the food. 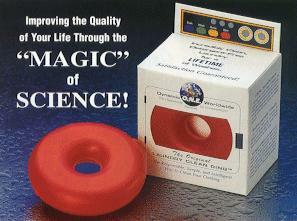 The Skeptical Inquirer did a story: Magnetic Water and Fuel Treatment: Myth, Magic, or Mainstream Science? And (it’s about time), the laundry disc now comes in stereo! Why stop at the washing machine? Attach the Magnetic Conditioning System (U.S. $70) to your pipes and get the benefits of structured water throughout the house. 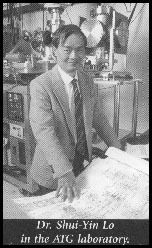 Dr. Shui-Yin Lo was more recently spotted in Wired magazine using his theories of structured water to explain homeopathy. Safe Wash not only sells laundry disks, but includes a link to the laundry-disk-skeptical World Wide Scam Network and is a member of something called the Association of Ethical Internet Professionals. “Warning! Your Laundry May Be Making YOU SICK!” according to this page. Asthma, allergies, cancer, dizziness, headaches, skin rashes, resperatory infections, acne, lack of energy and insomnia are listed as potential hazards of non-magnetic detergents.